Conditions were good across the beaches around the state yesterday with a long-range SW groundswell to 3-4ft at 13th Beach and 6ft on the Mornington Peninsula under light N/NE winds that persisted into the afternoon from the E-NE. The Torquay region was better than expected early with light morning N'ly winds but these tended E'ly into the afternoon. Today the swell is starting to drop with easing and less consistent 3ft sets on the Surf Coast with 4-5ft waves on the Mornington Peninsula under N'ly winds. The swell should ease steadily during the day as winds persist from the N/NE, keeping exposed spots across the state clean. There's been no real change to the weekends forecast with the swell expected to bottom out across both coasts through tomorrow, dropping back from 1ft to maybe 2ft on the Surf Coast and 2-3ft on the Mornington Peninsula. N/NE winds will again favour exposed spots across the state, persisting into the afternoon as the swell becomes tiny. Into Sunday though, our long-range and inconsistent but strong W/SW groundswell is still on track, generated by a monster frontal progression in the Southern Indian Ocean. This swell is building strongly across WA today and should reach a peak this evening, with it travelling towards us over the weekend and filling in Sunday. This swell will be extremely inconsistent but strong when the sets come with a peak during the afternoon due to 3-4ft on the Surf Coast and 6ft to occasionally 8ft on the Mornington Peninsula. Winds have been moving around a little for Sunday due to a tricky and weakening cold front/trough pushing in from SA, but they've since consolidated. The Surf Coast will be the best with fresh N/NW tending W/NW winds keeping the protected reefs and beaches clean as the swell pulses through the afternoon. Sunday's strong increase in swell should start to ease through Monday, but this easing trend will be slowed by a reinforcing W/SW groundswell for the afternoon and Tuesday morning. The Surf Coast should continue to offer strong 3ft sets with 6ft bombs on the Mornington Peninsula but winds will become a problem. The weakening trough is due to move east early Monday morning and with this we'll see winds swing onshore from the SE across both coasts. There's a chance for an early W'ly still on the Surf Coast though (variable on the Mornington Peninsula), so keep an eye on the local wind observations for an early. Into Tuesday winds are expected to persist from the E/SE creating average conditions and favouring slightly protected locations east of Melbourne. Wednesday should see winds swing back offshore from the N/NE across the Mornington Peninsula and possibly N/NW on the Surf Coast but we'll the swell will be on the smaller side. 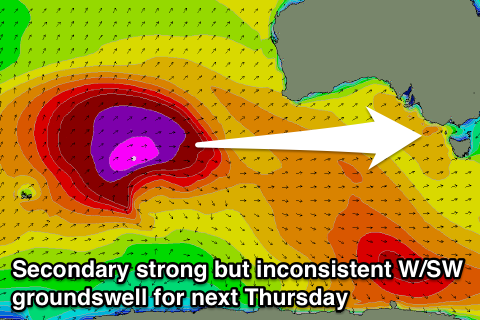 Into Thursday another long-range and very inconsistent W/SW groundswell is due across the state, very similar to the one due on Sunday. The one positive with this next system is that it'll stay a little further south and more in our swell window through its strongest stage as it fires up south-west of WA. The size of the open ocean swell off WA will probably be a touch under the current event, but similar sized waves are due across our state, coming in at 3-4ft across exposed spots Thursday morning on the Surf Coast and 6-8ft on the Mornington Peninsula. Winds aren't looking perfect but are looking good with a general light variable breeze that may tend locally offshore across both coasts before swinging SE into the afternoon. Friday looks as if it'll play out similar as the swell drops away slowly (buffered by another reinforcing W/SW swell), but we'll look at this again on Monday. Have a great weekend!